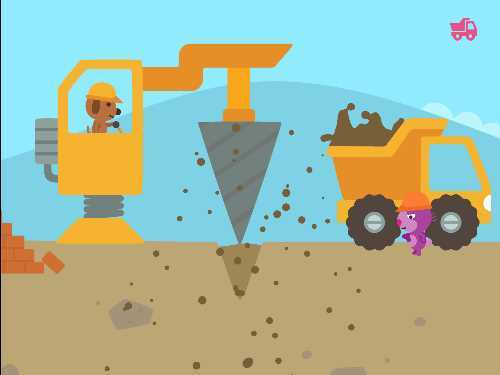 Rev up your littlest builder's engines with this construction site app that is perfect for toddlers and young preschoolers. Sago Mini Trucks and Diggers creates a kid-friendly construction site where children drive and control six mighty vehicles. Starring Rosie the hamster, the cute purple rodent encourages kids to play with each vehicle as they build six different houses for grateful new friends. Rosie offers kids six blueprints for houses, ranging from traditional homes to ones shaped like a mushroom or a cupcake! After choosing a building to construct, it's off to the construction site to collect dirt. While unrealistic, these houses are built by collecting dirt from the construction site, filling Rosie's dump truck, and then driving her truck to the home site to dump her dirt into the outline of the new home. 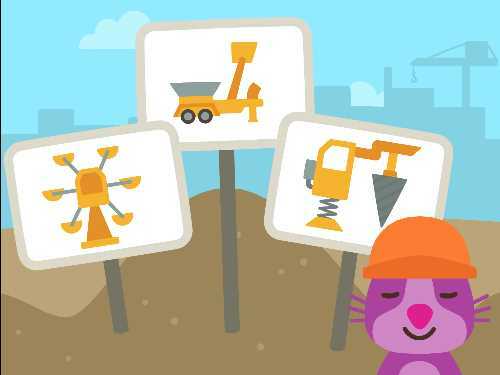 At the construction site, the app gives kids three vehicles to control. There are six vehicles within the app, so each time players select a new house to build, they see a different combination of the mighty trucks at their construction site. Kids can scoop up dirt with a digger or create dirt by grinding up a variety of practical (trees) and silly items (such as a diamond, a pineapple, or a beach ball!). They can also drill into the earth, and even fling dirt using a machine that looks like a Ferris wheel. When Rosie's truck is full, kids control Rosie's driving by dragging their fingers over the screen. If they scoot their finger up, Rosie magically flies in the sky! It is a short distance to the building site, and Rosie passes many characters and obstacles along the way. After the outline of the house is filled with dirt, the house appears. The app drops decorative items into the screen so that kids can get creative in how each new house looks. There are doors, windows, chimneys, and weathervanes. But kids can also add eyes, lollipops, Band-Aids, ribbons, pirate flags, and more. 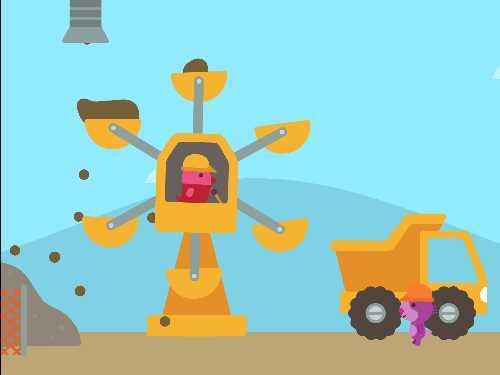 Sago Mini Trucks and Diggers is a must-have app for truck-loving tots. The simple touch controls put the littlest builder in charge of six big machines. And they get a sense of accomplishment when lifting the dirt into Rosie's dump truck, as if they are "large and in charge." The Sago Mini characters who drive these vehicles add to the fun, because each has a darling personality. Developer Sago Sago uses the same animal characters in all of their apps (see Best of Sago Sago Apps list to find more). so frequent users will welcome the return of Robin the bird, Jinja the cat, Harvey the dog, and Jack the rabbit. 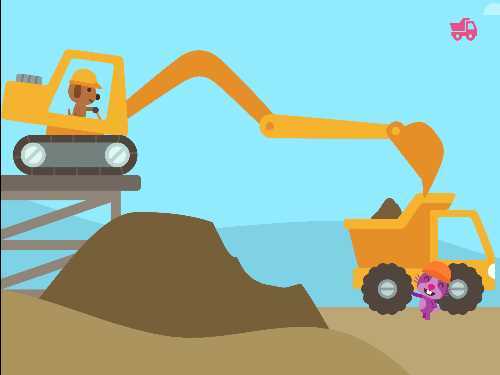 I think it is important that kids see both female and male characters working at construction sites, and Sago Mini Trucks and Diggers does a good job with this diversity representation. Another positive feature of this app is how it combines driving trucks with creativity. After building a home, players design the look of the house by choosing the color of paint and adding the doors and windows -- and crazy crooked chimneys, flamingos, and other fun personal touches. If you have a child who loves trucks and visiting construction sites, this is an app he or she will adore. Sago Mini Trucks and Diggers has uncomplicated controls making it an app that kids as young as age 2 can use. 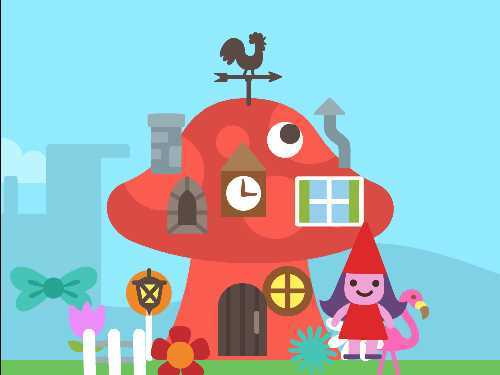 Parents, if you play alongside of your little one, use this app to encourage story telling. Ask your young builder: "Who are you building this house for?" The wackier houses usually get populated by adorable gnomes, so they can also be good fodder for the stories you create together. BONUS CONTENT: For more fun apps for truck lovers, see Vrooming Vehicles Apps for Kids. 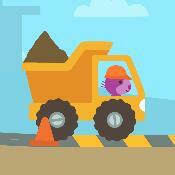 This kids' app review of Sago Mini Trucks and Diggers was written by Jinny Gudmundsen.